Manager Berwick Rangers, Rangers, Leicester City, Motherwell, Seville, Colchester United. Jock Wallace made national headlines in 1967 as player manager of Berwick Rangers when he led the club to a shock victory over Rangers in the Scottish Cup. He moved on to a coaching role with Hearts before moving to Ibrox to take on a similar role with Rangers in 1970. 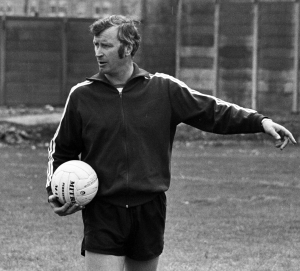 Wallace was manager Willie Waddell’s right hand man when the Ibrox club won the European Cup Winners’ Cup in 1972 and he took over as manager the following season. Wallace won the Scottish Cup in 1973 and in season 1974-75 he led Rangers to their first Championship title for 11 seasons. The domestic ‘treble’ was achieved for season 1975-76 and 1977-78. Wallace left Rangers in 1978 and moved to Leicester City where he would lead the Filbert Street club to the Second Division title in 1980. He returned to Scotland to take charge of Motherwell and then Rangers for a second time, where he would win two more League Cups. Towards the end of his career Wallace also had short spells as boss of La Liga side Seville and English side Colchester United.